Vincent Hron was born in 1961 in Omaha and received his BFA in painting/drawing from Drake University in 1984 and his MFA in painting from the University of Michigan at Ann Arbor in 1987. He was a guest artist of the Statliche Kunst Academi in Karlsruhe, Germany in 1987-88 then became an instructor of painting, drawing, and printmaking at Bellvue College and instructor of drawing and design at Metro Community College of Omaha. He has since left his teaching positions in Omaha for a teaching position at Bloomsburg State College in Pennsylvania. Hron is widely known for his paintings, yet he also creates many monoprints and lithographs. 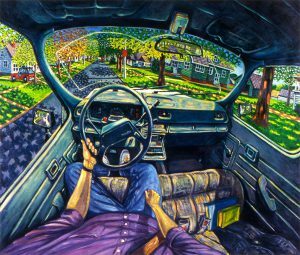 His works depict an unreal reality through their use of bright colors and exaggerated perspectives that evoke a sense of uneasiness in the viewer. Hron stated, “I am creating a poetic interpretation of space. It’s more of an intuitive arrangement. It’s just a way to lead people into the space.” He has been represented by galleries in Omaha, Lincoln, Des Moines, Kansas City, and Minneapolis and has a mural displayed in the Jones Street Brewery and Cafe near the Old Market in Omaha, Nebraska.